Design for a Highland inn composed as a main block of three bays and two stories linked by three-bay wings to single-bay pavilions, one of which is a kitchen and the other a stable. Below are two plans for the first and second stories. You are here: CollectionsOnline / Design for a Highland inn composed as a main block of three bays and two stories linked by three-bay wings to single-bay pavilions, one of which is a kitchen and the other a stable. Below are two plans for the first and second stories. In the opinion of A. 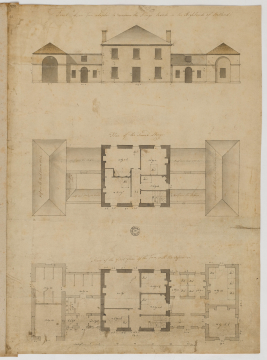 A. Tait, this drawing relates in time and place or subject to those contained in Adam volume 7.As the inscription makes clear, this was a design for an inn connected with the Scottish Highlands road building schemes of General Wade before and after the Rebellion of 1745. At this time very rudimentary accommodation for both travellers and horses was offered: 'horses received as much attention as that provided for their riders' (see A.R.B. Haldane, New Ways through the Glens, Edinburgh, 1962, p.178). The drawing shows the central block in dark grey wash and the wings in light wash. This may mean that part of the structure already existed in some form and perhaps explains the word 'adapted' in the inscription. The inscription on the verso may refer to the notable anti-Jacobite Daniel Campbell of Shawfield, who died in 1753, or one of his sons. The draughtsmanship is similar to John Adam's drawings in the 1750s for Inveraray.